I'm starting my Germany posts now. Woohoo! It was a lovely three and a half weeks in May and June, and despite the unseasonally cold and rainy weather, it was great spending lots of family time, shopping, and of course, eating all my favourites! 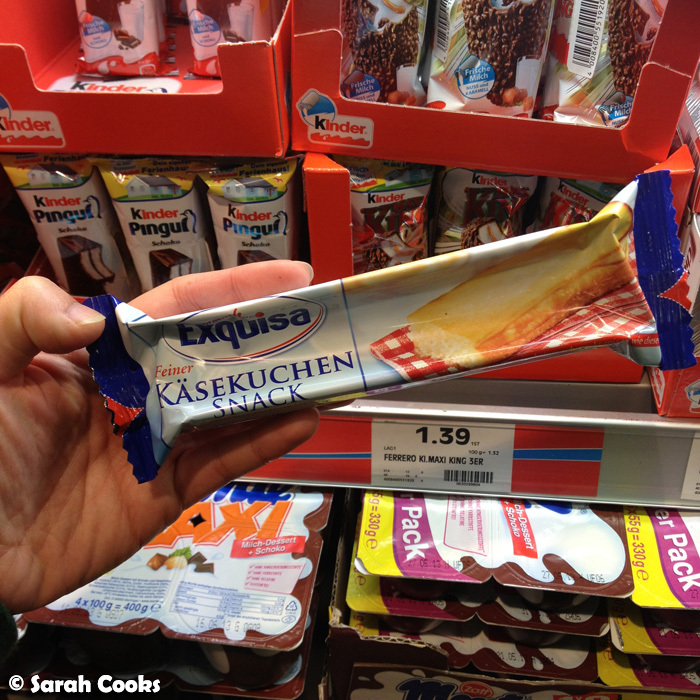 Today's post is all about: Supermarkets and Snack Foods! This post is inspired by the lovely Hannah from Wayfaring Chocolate, and her fantastic Snack Review posts. I love reading her observations on the sometimes weird but mostly wonderful snack foods she encounters on her travels throughout the US and Canada. 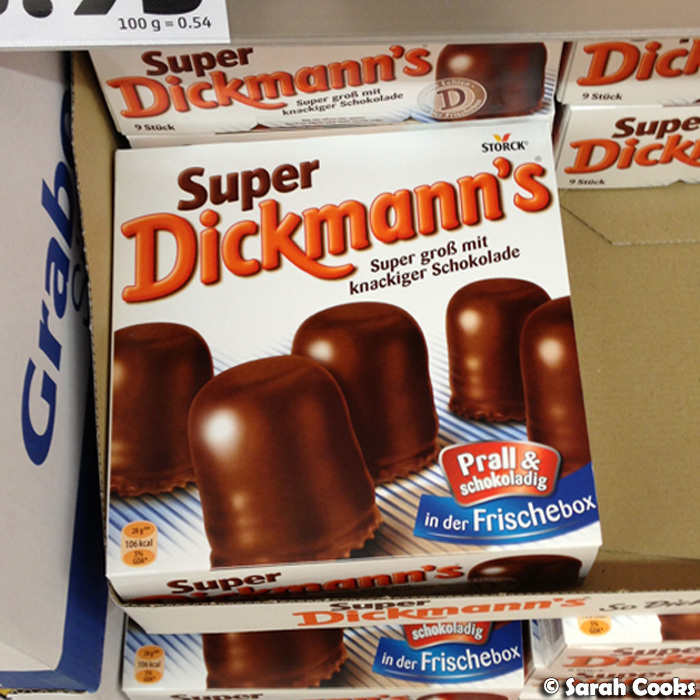 So, I love German supermarkets. Actually, let's take a step back: I love visiting supermarkets in general, especially in foreign countries. 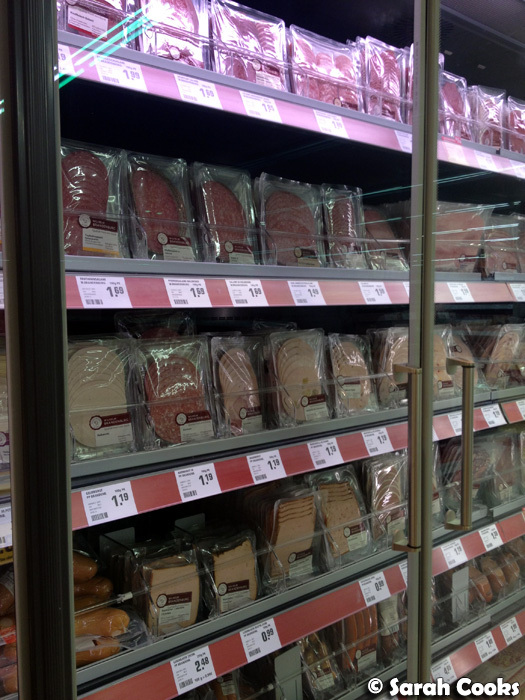 It's so interesting: all the different products, the packaging, even the way the supermarkets are set up. 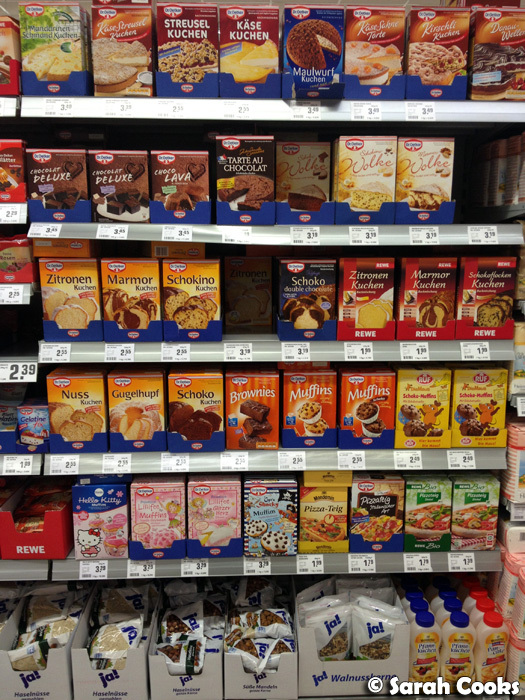 German supermarkets, in particular, are awesome. They're huge and they seem to have zillions and zillions of products, with a seemingly endless array of pork products, biscuits, and dairy. I also love the straightforward marketing. 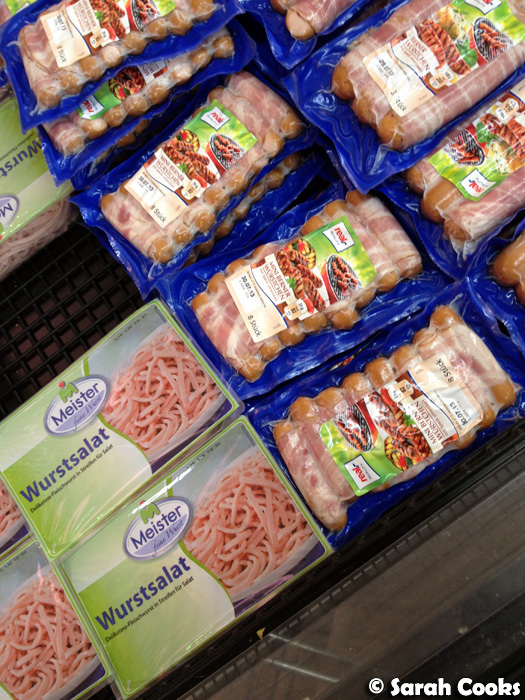 The motto of Treff, for example, is "gut und günstig" (good and cheap). One observation, which I'm sure the family got tired of hearing: checkout chicks and chaps in Germany don't seem to actually do anything. Firstly, they get to sit down! They scan the items, chucking them to the side of the register, and wait for you to pack your own groceries before giving them the money. The nerve! (That shiz would not have flown back when I was a checkout chick, hehe). 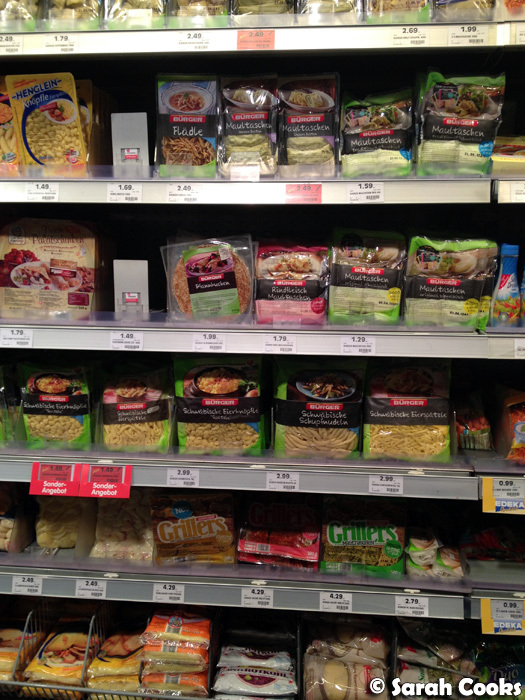 I love all these packets of different german pastas - Flädle, Maultaschen, Schwabische Schupfnudeln, Eierknöpfle and more. This type of homestyle German food is really underrepresented here in Australia - here we're all about the big Bavarian meals, pork hocks and the like. Enough Dr Oetker for you? Moving on to pork products. 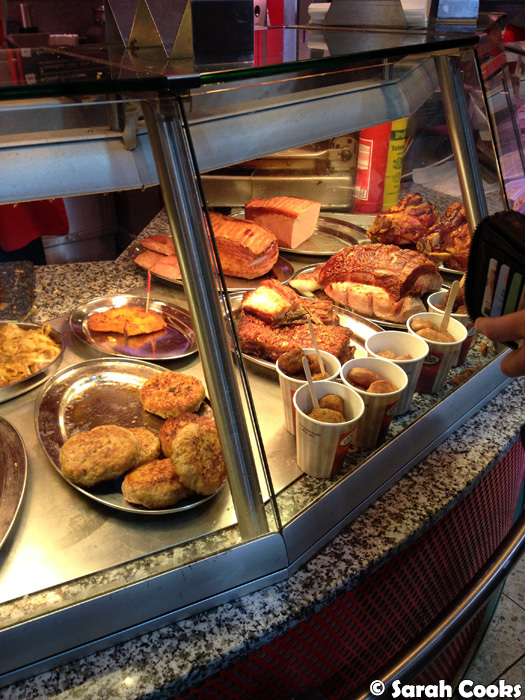 I've read that Germany is the spiritual home of smoked pork. 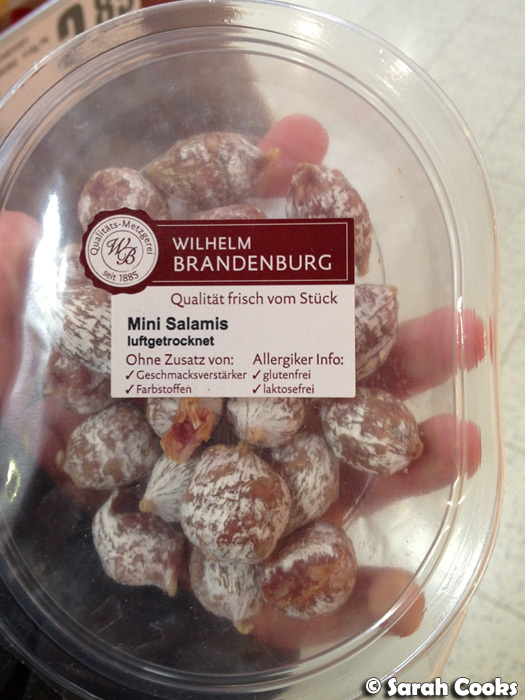 Whereas here in Australia we'd have to go to a market or specialty butcher for high quality smallgoods, German supermarkets, even the small ones, seem to have a huge range of amazing salamis, hams and other pork products. 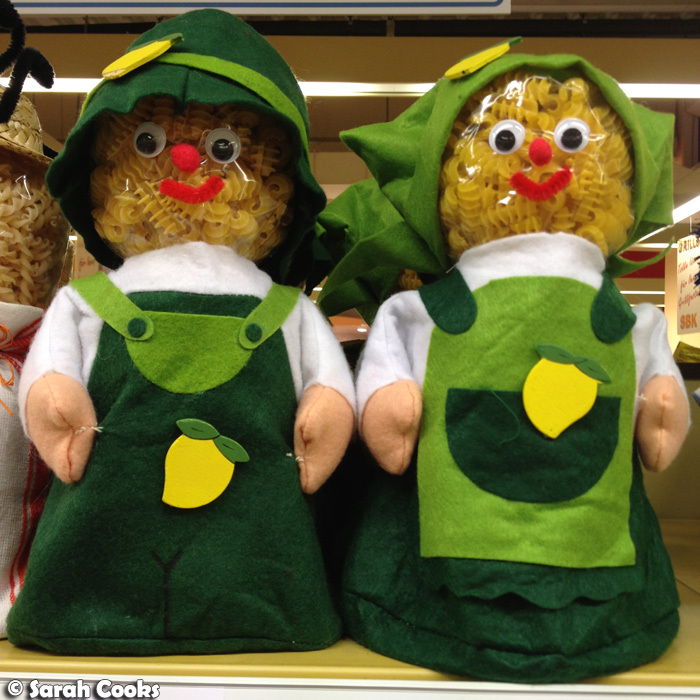 (The photos below are from really big supermarkets, by the way). This deli counter was from a supermarket. A supermarket! 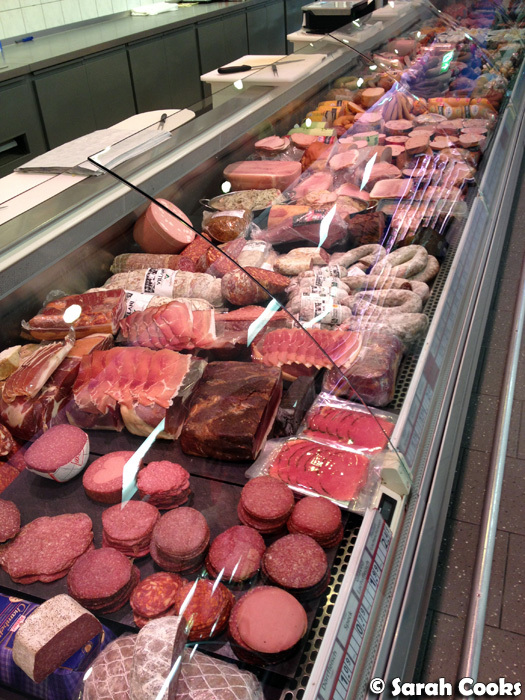 I couldn't even imagine a specialty butcher or delicatessen with a selection like this, let alone a supermarket. 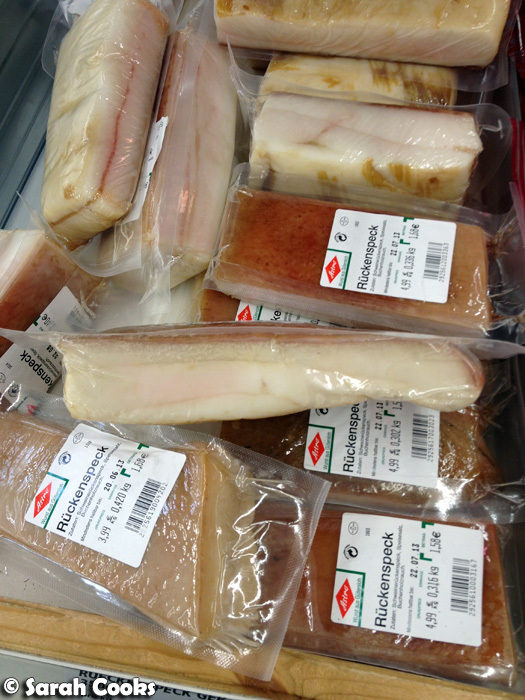 Fancy a piece of pure pork fat? 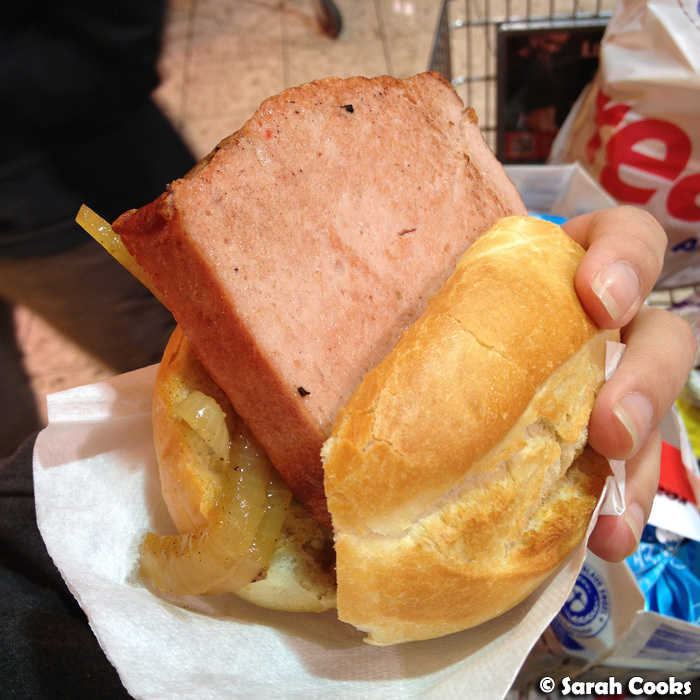 "Rückenspeck" means "back bacon". Mmm... I have no idea what it's used for, but I bet it would be good for potato salad or even adding richness to a stir-fry, Fuchsia Dunlop style. Mini sausages wrapped in bacon! Wurstsalat! (Yes, that translates to "sausage salad"). Now, let's look at some delicious snacks that I really enjoyed! 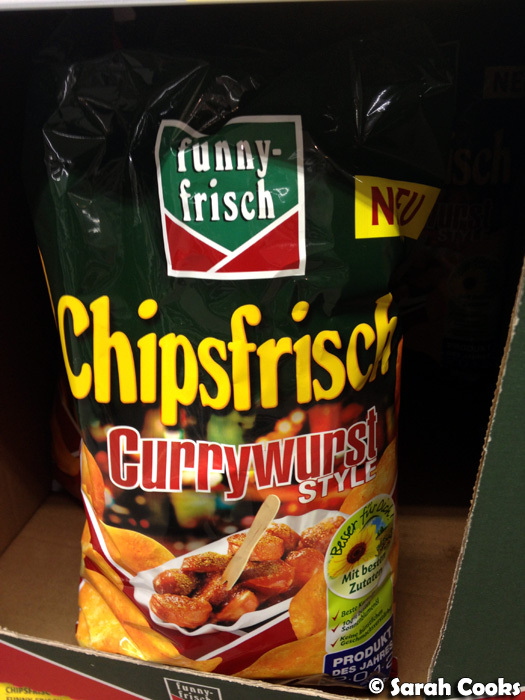 Currywurst chips! Delicious. (This brand also makes Emmental flavoured chips and they are awesome). 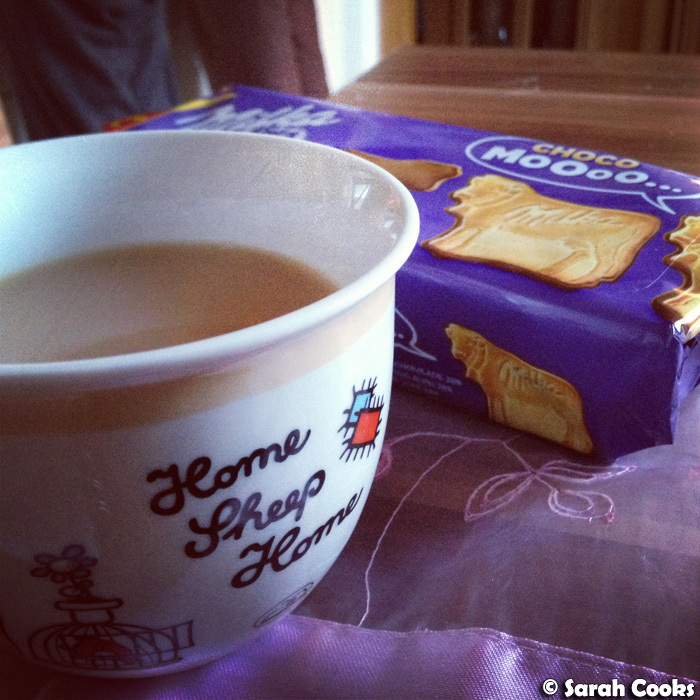 The next two pictures are of Milka brand biscuits. LOVE. These Choco-Moooos remind me of the animal biscuits we used to be able to get when I was a kid (Cadbury brand or maybe Arnott's, if I remember correctly). 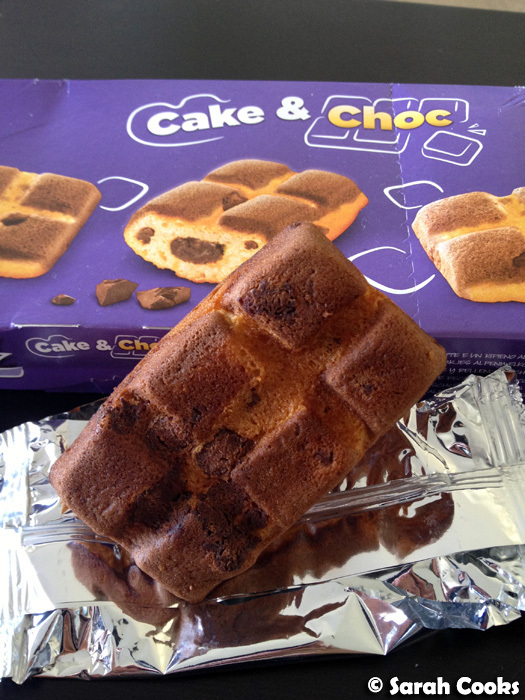 These Cake & Choc bars were so good: fluffy cake, with choc chips and a creamy chocolate filling. And the chocolate chips closer to the edge seem to have caramelised when they were baked, going all crisp and extra delicious! 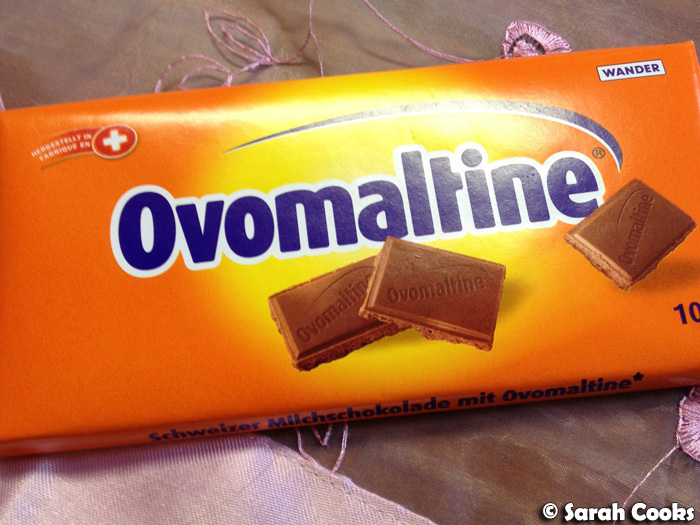 Ovomaltine: crunchy little ovaltine clusters enrobed in milk chocolate. Yum. 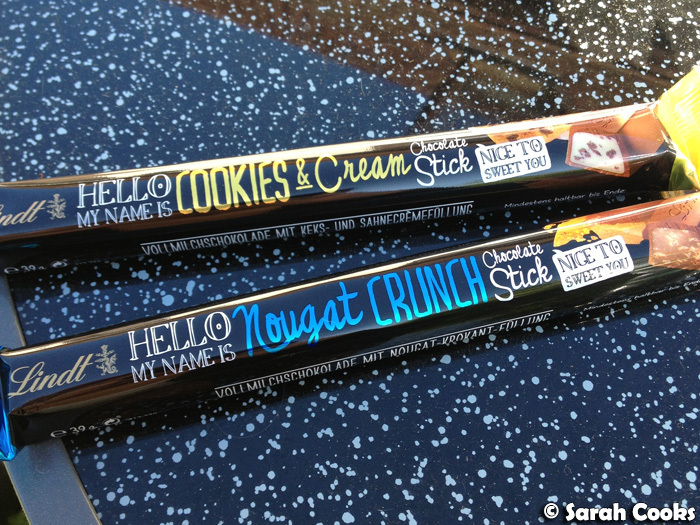 I fell in love with this "Hello My Name is" range that Lindt had released over there, and bought a rather insane amount to bring home - oops. There were different bars, sticks and truffles - nougat crunch and cookies & cream were my favourite. It's nice to sweet you, too! Cool! A bar of cheesecake! 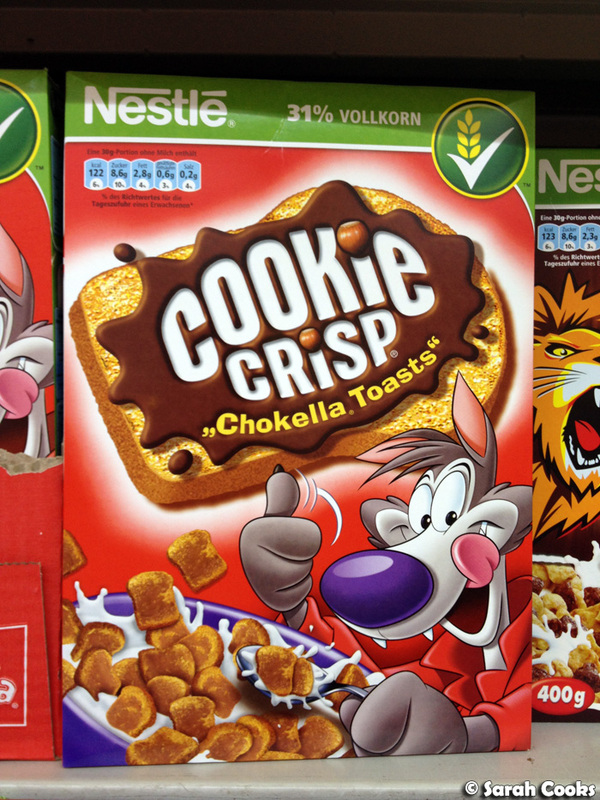 I bet these Cookie Crisp "Chokella Toasts" are very very healthy. 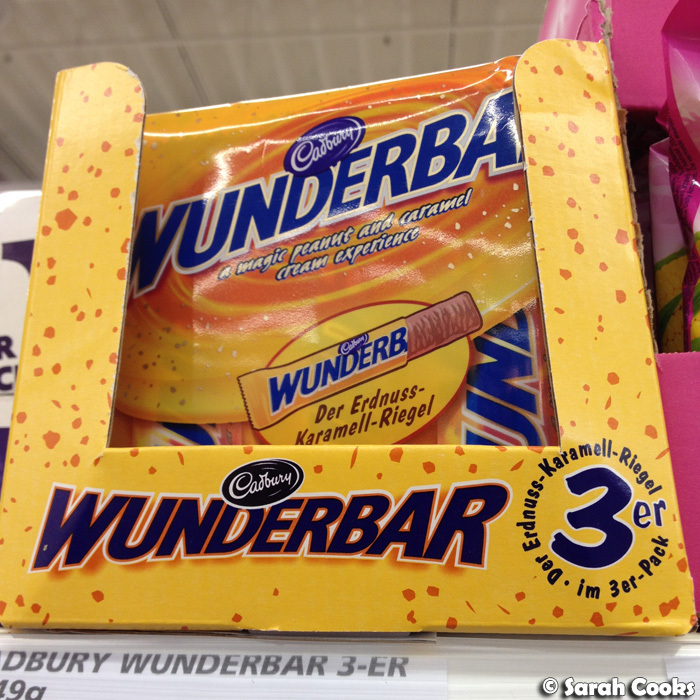 Wunderbar, get it, get it? 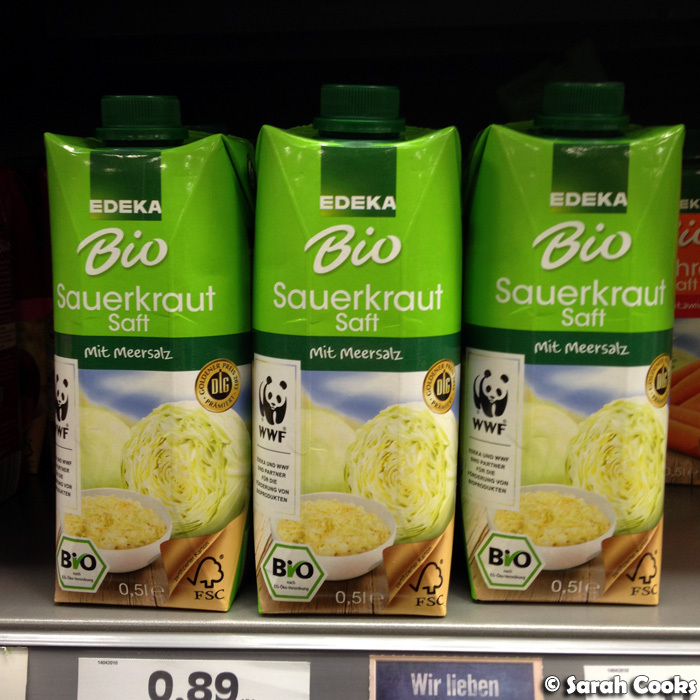 Anyone want some sauerkraut juice, with sea salt? I didn't think so. (And yes, this was in the beverage aisle). Ahem. I don't even know what this is. Here's a very tasty Fleischkaese im Brötchen. 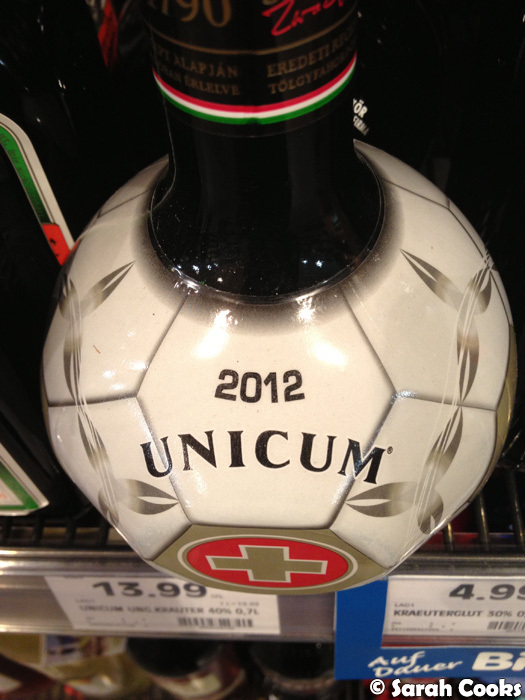 Unicum is THE local spirit to drink in Hungary. It's quite nice actually, very herby. Sort of a more healthy tasting (though I'm sure it's not actually healthy) Jaegermeister. And yes, the name is hilarious! I loooove checking out supermarkets in new countries - they have such cool snacks and different food. It's a great way to get an insight into other cultures! Aaah!! Bahaha! Your intro just made my day; I never would have dreamed my indefatigable snack-buying/eating/reviewing ways could be viewed so positively and used as inspiration. Um... yes, I definitely would have bought the sauerkraut juice. No joke. And the cheesecake bar. 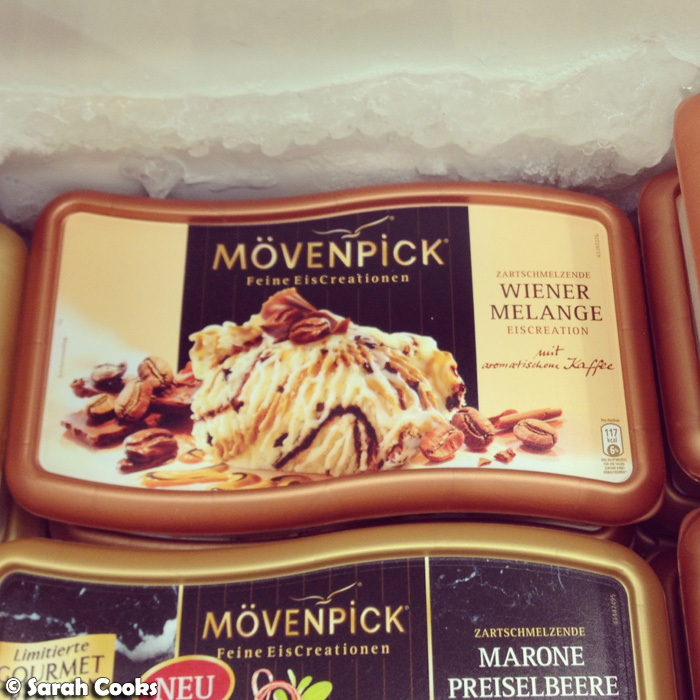 And I definitely need some weiner melange. You can keep that alcohol though; I don't want to get pregnant. Haha coincidentally my boyfriend and I have been kinda planning a European holiday for next year. 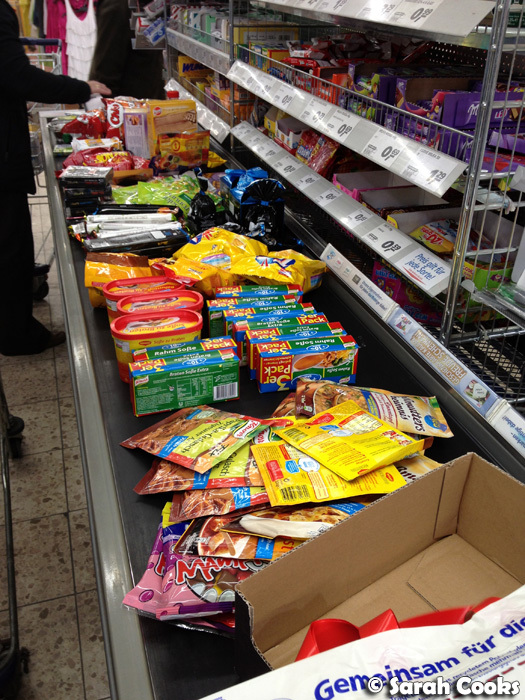 We're definitely spending a week or two in Germany and because I love supermarkets so much, you can imagine how excited I was when I saw your post! Did you see any Vita Cola cans while you were there? This might be my favourite travel post yet! Supermarket snacks are the best tourism, I reckon. I swear Germany is like the coolest place ever! Love how you took us through the supermarket and introduce all the things they have to offer. Everything sounds so cool! I'd buy a whole heap of stuff back to Melb if I went there too. Love this post because funnily enough my big bro and sis and I always have a tradition when we travel to a new country together (which is very rare). 1) Eat at local Maccas. 2) Checkout local 7-Eleven (so diff in each country!). 3) Go nuts at the local supermarket. Supermarkets are such a great way to peek into the households of the residents of that country (not just markets). Really love this post!